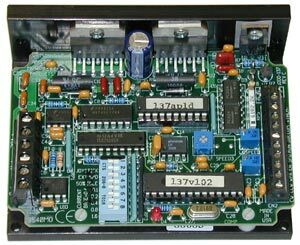 The 3540MO step motor drive is a microstepping, bipolar stepper drive for velocity-control applications, such as conveyors and labelers. The 3540MO steps at a fixed microstep resolution of 12,800 steps/rev with a 1.8º step motor (1/64 step). Motor speed is controlled by either on-board potentiometers or via external potentiometer wired to the drive’s analog input. Starting/stopping the motor and direction of rotation are controlled by digital inputs. The drive also includes an enable input and a digital tach ouput function for monitoring motor speed. The 3540MO can also be used with potentiometer-type joysticks for joystick control of the motor in both directions, forward and reverse.